Women's fiction … like the women who read it … has evolved to include subjects and themes that range far beyond romance. 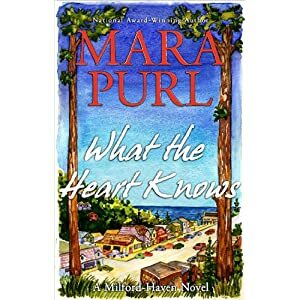 Romance, wisdom and mystery are the topics of What the Heart Knows by award-winning author Mara Purl and resonate with women readers. In the first novel of her Milford-Haven novel series, you will meet Miranda Jones who is a wildlife artist plus a cast of characters that include a television journalist, an environmentalist, a Native American part-time student, a builder and an heir to an oil fortune in the fictional coastal town of Milford-Haven. This contemporary saga is what women want. The stories follow the lives of the main characters, each a complete storyline, but their stories also continue as the Milford-Haven novel series progresses. Mara Purl launches her book, What the Heart Knows , in September 2011 with a Hardcover Edition published by BelleKeep Books in association with Midpoint Trade Books. Miranda Jones, 29-year-old female protagonist wildlife artist, escapes a life of privilege to create her own identity as an artist, and as a woman, in the small coastal town of Milford-Haven. Chris Christian, a local television journalist, follows a lead to the unfinished Clarke mansion where she’s killed by an unknown man, then buried under the house. Sally O’Mally has moved to Milford-Haven from Arkansas and created a successful restaurant on Main Street. But her secret affair with Jack Sawyer is shredding as she learns about the secrets he’s been keeping from her. Samantha Hugo, accomplished middle-aged woman is a leader in the environmental field, but wrestles with having given up her son for adoption years earlier, as revealed in her personal journal entries. Susan Winslow, Native American part-time student, wrestles with her heritage, her own identity, her relationship with a father just released from prison. Well-known builder Jack Sawyer tries to ignore his true calling as an architect, cuts corners as a builder, and does his best to undermine Samantha Hugo, his former wife. Zack Calvin, heir to an oil fortune, takes a brief vacation north from his Santa Barbara home, and finds a painting he must own. When he meets the artist Miranda Jones he begins to pursue her, despite another romantic entangle back home. Milford-Haven began as an original radio drama Purl created. It was a hit on BBC Radio with 4.5 million listeners in the U.K. and won the Finalist Award for Best Radio Drama, the New York Festivals. Listeners began requesting books based on the radio drama, which led to the adaptation and development of the novel series. Twelve books are planned for the novel series, with additional short story collections. The Novels are also being published as audio books performed by the author. The first won the Silver Ben Franklin Award for audio. The second wonthe Gold USA BookNews Award for audio. Purl began her writing career as a journalist for the Associated Press, Rolling Stone, The Financial Times of London, Working Woman Magazine,and The Christian Science Monitor. A prolific fiction author, she also has written a play and several non-fiction books including Act Right: A Manual for theOn-Camera Actor with actress Erin Gray. The hit song “Jet Laggin’” she co-wrote with Marilyn Harris is in current release on the new CD Orphans. While this book is more geared toward women, I will say that the author has done a great job at building a great mix of characters that you will not forget. Each character is very unique and she is able to pull together a plot pulls the reader in and engages them from the beginning to the end. As a person who enjoys mysteries, this book was well written and the author did draw me in and kept me on the hook as I read through the book. I also loved the fact that I was kept in the dark about the end of book and where it would end. If you are looking for a book that will intrigue your senses and engage you from the beginning to the end this book is one you will want to put on your list!